Looking for a store where you can find an extensive selection of cell phones from the leading carriers? Then look no further than Wirefly, one of the best online retailers of wireless cell phones from reputable brands. For four consecutive years, Wirefly has been one of the top five electronics shopping websites as rated by the Hitwise visitor rankings. Wirefly is partnered with leading wireless telecommunications providers such as Cingular, Verizon, Nextel, Sprint, T-Mobile and Alltel. These partnerships let Wirefly offer flawless services as well as hassle-free, quick activations. Wirefly is a subsidiary of Reston, a part of the Virginia-based Simplxity, LLC. Besides offering a splendid collection of the latest handsets from the leading cell phone brands, Wirefly also offers improved comparison tools to let you easily compare cell phones from every carrier. Many of the phones featured by Wirefly are either available at special discounted rates or are completely free of cost with qualified wireless plans from different carriers. Just log on to Wirefly; it is a one-stop shop for all sorts of mobile handsets along with seamless wireless cellular services from giant wireless telecommunications carriers. Search by carrier to see what carrier-specific deals Wirefly currently has. 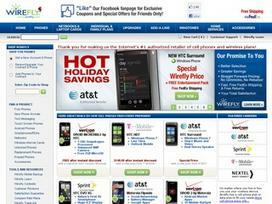 On Wirefly's home page, you will find dozens of free phones with selected call plans offered by specific carriers. Before you place your order, compare different rate plans to choose the one that is most appropriate for your needs and budget. Laptop cards, broadband cards, WiFi cards and modems are also offered with special data plans. Besides dozens of cell phones, smart phones, PDAs and touch screen phones from leading cell phone brands such as Blackberry, Nokia, Motorola, Sanyo, LG, Samsung, Kyocera, UTStarcom, Novatel and Sony Ericson are also available at Wirefly at special discounted rates. You will find several prepaid cell phone plans from various carriers, as well. Looking for an unlocked phone? Wirefly has a huge variety at great prices. If you're satisfied with your plan, but what to change your cell phone, an unlocked phone would be the perfect choice. Along with plenty of cell phones, find compatible wireless connection devices at Wirefly, which also specializes in cell phone accessories such as Bluetooth headsets, adaptors, SD cards and chargers. Wirefly is the ultimate place to find great cell phone deals and plans. Moreover, select specific plans availably only at Wirefly. Most merchandise is offered with instant rebates. Browse the website and get connected to a plan that suits your budget and needs. Hurry and visit Wirefly's huge selection of cell phones today! Share what you think about Wirefly, and your favorite ways to save there!